Hillary Clinton’s visit to the Middle East was aimed at tackling Iran and Syria. But was she too aggressive? Does U.S. Secretary of State Hillary Clinton want confrontation and war in the Middle East, or dialogue, reconciliation and peace? Her pronouncements and policies during her visit to the region last weekend suggest impatient belligerence. Indeed, she seems intent on spreading mayhem, to the puzzlement and anxiety of many of the locals, as I discovered on a visit that coincided with hers. In Riyadh last Saturday, she returned to her now familiar theme of seeking to incite the Gulf Arabs against Iran, a country she insists on demonizing as “a regional and global threat.” At a meeting with foreign ministers of the six-nation Gulf Cooperation Council (Saudi Arabia, Kuwait, Bahrain, Qatar, the UAE and Oman) she proposed erecting a strong missile shield to protect the Arab states of the Gulf. “It is a U.S. priority” she declared “to help the GCC build a regional missile defense architecture” against what she saw as a looming ballistic missile threat from Iran. It’s hard to see how Iran would have any conceivable interest in attacking, let alone destroying, the Gulf states, since they are among its prime business partners – or at least they were before the U.S. tried to sever Iran’s long-standing banking and commercial ties with places like Dubai. Catherine Ashton, the European Union’s foreign affairs chief, is attempting to re-launch negotiations over the nuclear issue between Iran and the five permanent members of the U.N. Security Council and Germany (the so-called P5+1). But instead of lending America’s full support to these efforts, Hillary Clinton insists on casting doubt over Iran’s sincerity in wanting to reach an agreement. “It’s up to Iran whether they are ready to make the right choice” she declared in Riyadh. “What is certain,” she added, “is that Iran’s window of opportunity to seek and obtain a peaceful resolution will not remain open forever.” This is precisely the language we are used to hearing from Israeli Prime Minister Benyamin Netanyahu. Is Clinton now saying that America has embraced the Israeli objective of forcing Iran to accept “zero enrichment”? If that’s the case, she is undermining efforts to re-launch talks with Iran before they have even started – which is precisely Israel’s objective. For his part, President Barack Obama has continued to ratchet up sanctions on Iran, with the evident aim of closing down its oil exports. But such measures, however crippling, are unlikely to make Iran yield. What the Islamic Republic wants is respect, recognition of its regional role and guarantees against attack – notions that are apparently totally absent from the mindset of the U.S. secretary of state. From Riyadh, Clinton went to Istanbul to attend the “Friends of Syria” meeting, where she again preached confrontation rather than reconciliation – this time against Syria. Kofi Annan, the former U.N. secretary general, has been mandated by both the United Nations and the Arab League to seek a peaceful resolution of the Syrian crisis. Last Monday, he told the U.N. Security Council that the Syrian government had pledged to adhere to the ceasefire and pull back its troops by April 10, in accordance with Annan’s own six-point peace plan. But on Syria, as on Iran, Clinton has displayed nothing but impatient belligerence. As if seeking to undermine Annan’s mission, she has misrepresented his objectives. Annan called for a simultaneous ceasefire by both the regime and the armed opposition. 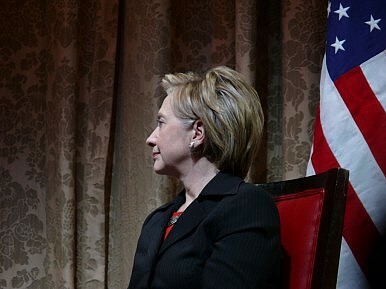 But Clinton has accused President Bashar al-Assad alone of having failed to keep his promise to pull back his troops. Instead of urging the opposition to put aside its weapons and accept a ceasefire, she has put the onus of stopping the fight on Assad alone. Her demand that Annan impose a “time line” on Assad risks subverting Annan’s peace mission. By setting up a working group to coordinate U.S., EU and Arab sanctions against Syria, Clinton’s evident intention would seem to be to bring down the Syrian regime in order to weaken Iran. By seeming to fear a peaceful settlement of the Syrian and Iranian crises, she has exposed America’s aggressive face. Annan’s mission has only just begun. It might take weeks, if not months, before it shows results. There’s clearly a need to give him more time, while pressing both sides to put up their guns. Similarly, Ashton’s attempts to re-start a dialogue with Iran in order to arrive at an overall settlement should be given every encouragement and not sabotaged by unnecessary threats and crippling sanctions. The United States should be careful not to add to the catastrophic legacy of its wars in Iraq and Afghanistan, not to mention the violent hostility its policies and actions have aroused in Pakistan, Yemen, the Horn of Africa and elsewhere in the Arab and Muslim world. Covert operations may offer the best way of slowing Iran’s nuclear program without all-out war. But how long can they last?